Sravya is not a common mother as she is the one who just for storing the memories of her little son started making handicraft items. 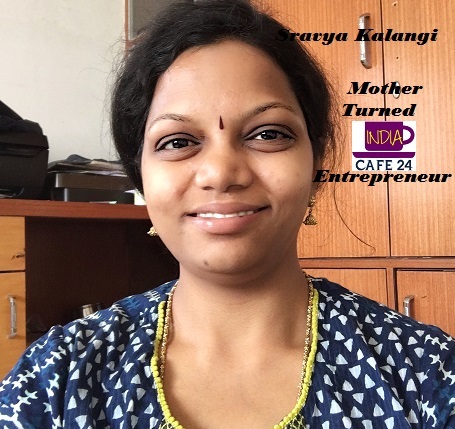 That’s the beginning and she decided to stay back home for her son’s good upbringing and started working from home by turning her passion in to profession and thus MINI ENTREPRENEUR SRAVYA was born. Check the chit chat session we had with her. Hai Samata and Team,and Big Hai Dear Readers.Myself Sravya From Bangalore.A Graduate in Electrical and electronics Engineering with distinction.coming to my family all our family are job holders no one into any kind of business..where in my husband works for a reputed MNC.and Father is a Retired Administrative officer.My Father-in-Law is a Retired Head Master.Both Mother and Mother in law are best Home makers who always take care about us.I have a Brother who again works for a reputed MNC..and I have a almost 2.6 year old(Son)Toddler[yes Very Naughty lil one]who is the main reason for my venture..Soon after his Birth “The Craft Lady” came into my mind..But It took months.. before I launch my page ….I started Making something to preserve my son memories in a unique way and so I am done with a lovely first professional scrapbook,then after I published it into social media, on the same day I got great applause over social media and people are asking me whether I can make one for them and asking Do u take orders.?? 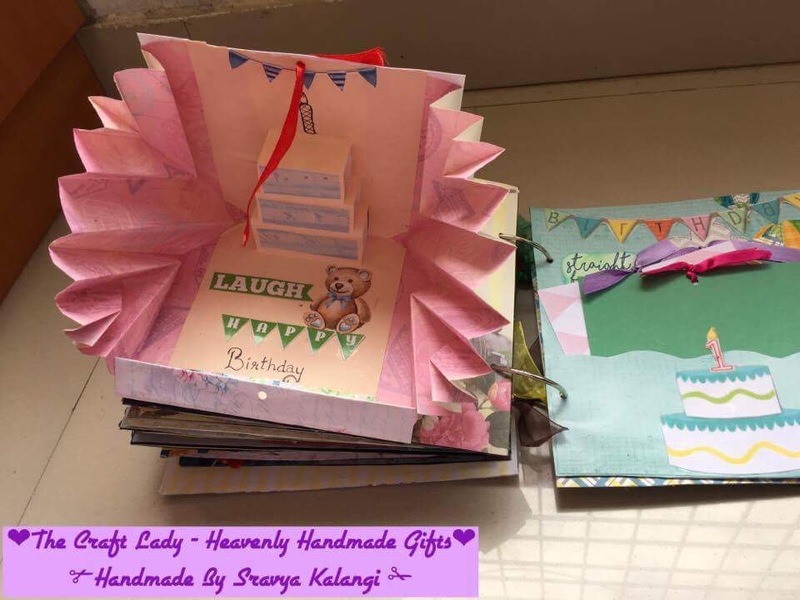 Like that many queries in my inbox ..so I decided and started my Venture ..
“The Craft Lady -Heavenly Handmade Gifts”… Tada ..I am done..So Happy..
2) You are a homemaker and also a small sized entrepreneur. All women are homemakers be it a working woman or a non working one, but what makes you different from them. Yes, I am a home maker and A Mini entrepreneur.But before this crafting has turned into my proffesion,I always have a dream to work with some big corporate companies,But ever since I turned my passion ( crafting ) into proffesion, Then I have a 7 digit salary satisfaction in life , later on I also realized that I can work with my comfort of timings , yes I can also take care of my baby ( appointing a nanny is what I don’t like), yes I can cook/clean take care of family ..out of all these I can also earn some bread and butter to family with my earnings ,there lies the 100% satisfaction and so happy to create/craft something new everyday with all my daily chores around me. 3) As per you How important these days for women to be self dependent or independent financially and in their thought-process ? I Feel, Its not about the women should be financially Independent…But yes I feel women should be Financially Supportive to the Family..as we already know ‘Idle Mind is Devils workshop’…so I feel we shouldn’t sit idle keep on working with the area of our interest,in the same path we can be supportive to the family. 4) Who discovered your creativity first? Discover in the sense!!! ..don’t know really..Actually from the time I was a kid ,..I am on creative side..I used to draw,paint,make small crafts with stuff in home(that days in 90’s can’t that afford to buy proffesional crafting stuff),Mom used to do stitching painting crochet etc ..from her it’s all came Inherently..in my childhood I got many appreciations for my drawings etc from family ,friends ,school teachers ,neighbours etc ..That’s all letting me to Craft Now . 5) What type of creative work you actually do ? Wow..good question.. Ha..Ha..Yes I do all sorts of crafts either it’s a paper or fabric or others…let me elaborate..in the name of crafting I tried my hands on Painting(fabric),scrapbooking ( My first huge (yes very very huge) applauded work), Felt crafting( Busy/Quiet Books, Busy mats , Puppets , hair accessories all made with felt fabric), pot painting,Glass painting,Calligraphy,sospeso(an Italian art) ,Apart from this I am also a digital creative geek …ha..ha..yes I do Animated E- invites , Chalkboard posters (which are very much trending for events),.recently I am also trying my hands with Murals n Nameplates ..shhhh!!! It’s all coming up..
6) Being a crafter do you think that there are true admirers of craft work in this world or its just a hobby type of work for many? What it is for you? 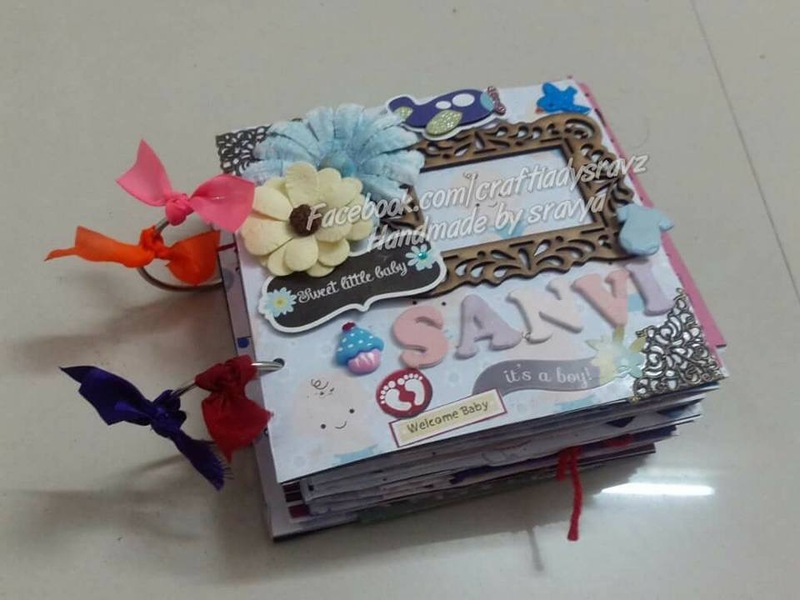 I feel it’s a Hobby till now,But Now a days things are changing rapidly handmade gifts and crafting is becoming more popular and people are opting for handmade gifts to cherish their beautiful moments, so now crafting is something more than a Hobby..
7) Say something about “The Craft Lady”? 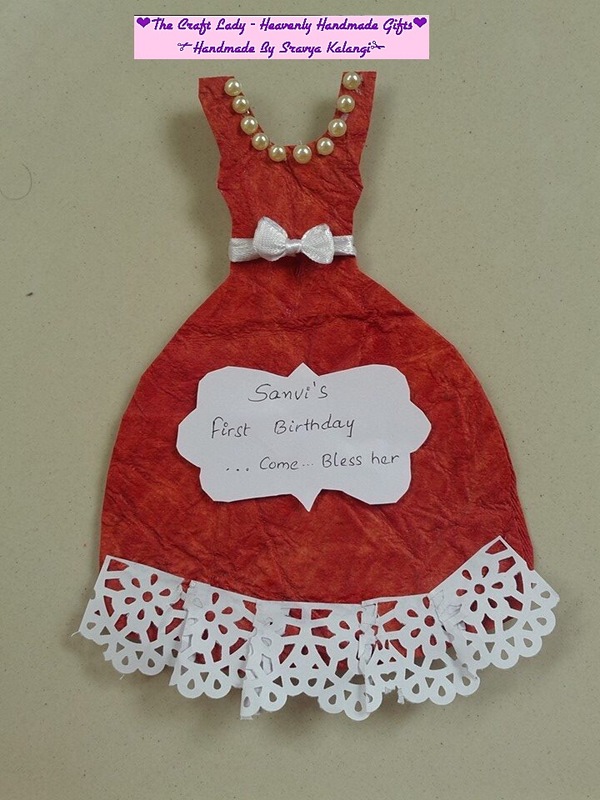 Yes.”The Craft Lady -Heavenly Handmade Gifts” My venture. While I was thinking about different names ,I thought many others like paper dreams,Crafting Career etc..Bit I finalised this bcoz,I do many many different types of crafts Not only sticked to Paper crafts But also I do many other kinds of crafts ,then I was asking my husband to suggest.., as he already suggested many but I am not liking ,My husband told dear craft lady leave me and think your self…so in his words ..I found this The Craft Lady…then just thought for the tag line ..and got heavenly handmade gifts in mind…..All Thanks to Hubby who encouraged me in all aspects. 7) When people show interest towards buying your craft, do you ever analyze what will be the future of your art in their hands or you try to understand conversing with them what actually provoked them to buy the craft ? Actually when a client Approach me to craft for their occasion, I feel they would cherish it for life time, so I always ensure to make final product with high quality n I make it highly durable ad as I use acid free papers for my scrapbooks which are against in yellowing for decades so they can preserve all the memories for life time,..there lies the success of The Craft Lady. 8) Who taught you these art and craft work? Roots are from my Mother, but I am self taught crafter of course I refer google and YouTube for few ideas, ..now a days we have ample of online resources, Just one thing is needed Zeal,enthusiasm and Zest to learn ..then u can feel on top of World. 9) Do you conduct classes ? Yes started recently,and happy to share my knowledge and now happy to see the spark in students faces when they create something new. 10) What are your expansion plans for The Craft Lady? Plans are very big , but to be frank no people to work with me , I am searching for people to work with me n produce surplus,( as I have tons of orders but no time n people simply rejecting many orders) but to my bad in this meteropolitan cities really I find very less people with passion to work and to coordinate with me . 11) Is there anyone to assist you in taking class? What is your team size? No one really , I myself Manage everything. 12) What else you love to do apart from your creative work? 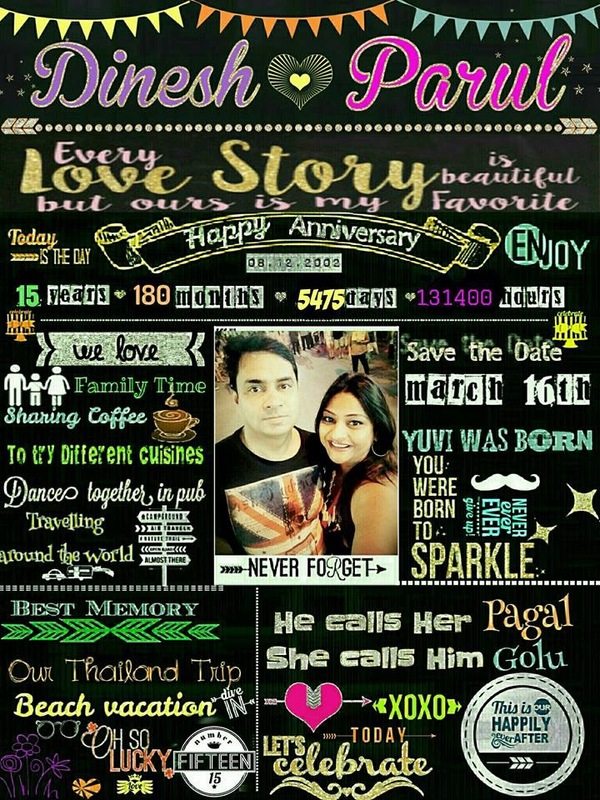 Apart from this I love to cook/ travel/ listen to music and most importantly I love to play with my lil one ,who is my stress buster ,we ( me n lil one) daily read books, play , do activities …I mainly do many DIY activities for my son to keep him engaged and I make sure to keep him away from all n all Gadgets. 13) If you get chance then will you take up classes to educate underprivileged people who can earn by by learning from you? 14) Who is your biggest art critic? As it’s a nuclear setup,it’s my hubby..he is ready with suggestions when ever I am in need. And many thanks to my In-Laws and parents who always and always very help full for me,my Mother-in-law and Mother gave me their very old age craft stash when I started this venture,. That’s a very lovely gesture I feel..Many thanks to them. 15) What are you plans in this year? 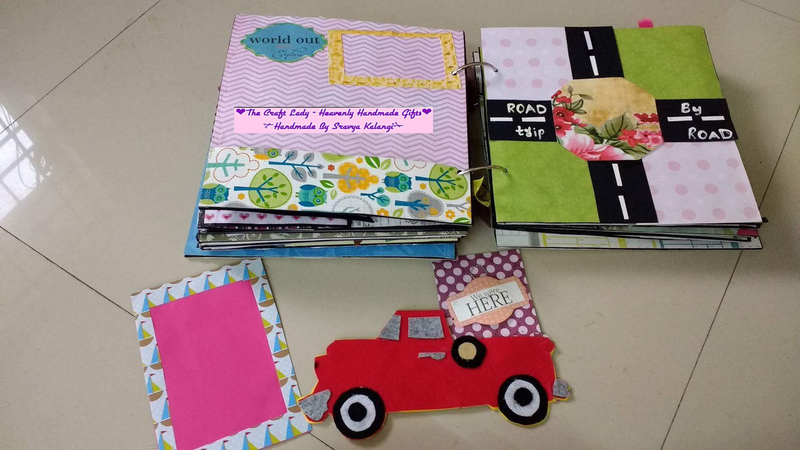 This year I just had a plan to start teaching my crafting to people,so started taking classes ..and yes they are all going good now. 16) Describe Sravya the crafter in one line? 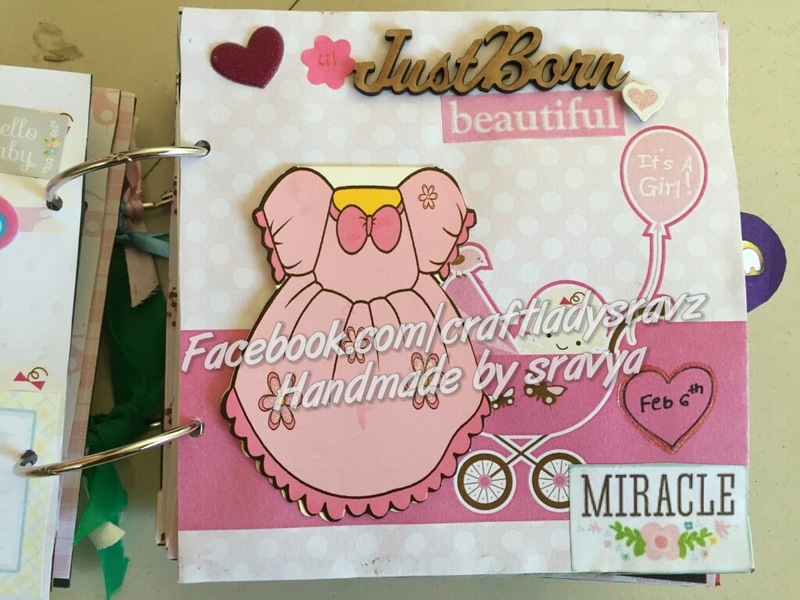 Hmm.. Sravya,who craft with whole heart(A Craft Bug) and one who enjoys learning new things Daily.